Jim Edwards is best known for his depictions of iconic buildings and bridges of the North East of England. 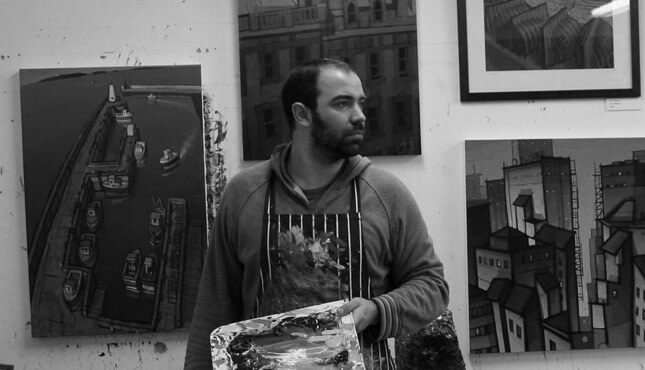 His Newcastle Cityscapes are some of the most recognisable art to come out of the region in recent years. His work falls into two genres, contemporary cityscapes and abstract paintings inspired by manmade forms and buildings. Both styles follow a theme of architecturally inspired structures and dominating linear form. Edwards' cityscape paintings are not studies from life, nor is he trying to capture a particular viewpoint or moment in time. His paintings have their origin in memory, how he remembers the workings and landmarks of the city, rather than a straightforward representation. The compositions evolve from a combination of imagination and selective memory, which are then altered and exaggerated. Certain buildings are forgotten, or simplified, creating a personal view of the city. This personal impression of cityscapes often runs into his more abstract work, where the block shapes he paints represent manmade forms, rooms and human spaces. These combine with connecting lines, suggesting marks within a landscape, pathways linking seperate constructs.